Want to take your workouts up a notch? Throw in a bit of suspension training. Love it. The equipment is pretty simple. I personally use the TRX from Fitness Anywhere; which I'd highly recommend. Beautiful thing. In terms of space, the workouts don't require all that much - though it's great if it's available. As long as you have room to get into a basic push-up position, you'll be fine. 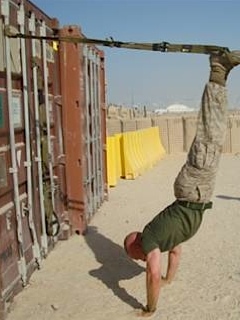 What can you do with a TRX? Umberto Miletto has a few ideas. 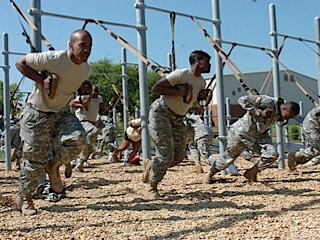 Suspension training is ideal for partial assistance in bodyweight exercises such as pistols (below) and pull-ups. C.J. Murphy details a progression to full pull-ups using Blast Straps. Nice one. This is a great chin-up variation, allowing for a small amount of rotation during the movement. Love it. As Laree notes: ‘You can work pretty hard with this simple pair of straps’. Finally, suspension trainers are ideal for working up to handstand push-ups. As you can see in the photo below, it's easy to adjust the angle (and difficulty) by starting further and further away from the wall. Perfect. Just getting started? Over to Derek. Jason Kirby takes a look at a number of items designed to make your bodyweight workouts just a little more challenging. Steve Maxwell demonstrates an excellent combination of suspension training and the taekhte (push-up board). Good fun. There are a few similar offerings on the market, and the TRX is a clear favourite. Just hook it up and go. Perhaps Monkey Bar Gym's Jungle Gym is more your cup of tea. Great thing. As with everything Dave puts his name behind, these things are tough. Brilliant. There's also an incredible array of articles and videos on this site. Use the search box at the top of each page, or send me an email. I love incorporating suspension training into my bodyweight workouts - particularly when travelling. Just hook it up and go. Beautiful.